​Pack 'n Plays are a safe place for your Little Traveller to rest and get changed. Two options offered. You decide! - With or without diaper changing station. Infant to toddler. 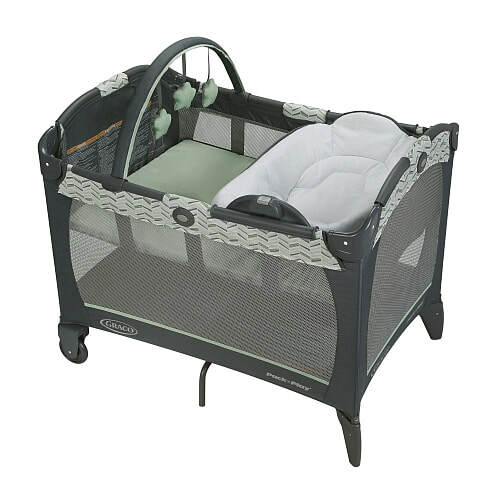 Infant bassinet provides a cozy sleeping spot for baby, at home and away, and is easily removed to accommodate your child. Bassinet for Little Travellers up to 15 lb (7 kg). Changer for babies up to 25 lbs (11 kg), and playard for Little Travellers under 35" (89 cms) tall. Optional: 3" Mattress for the comfort of your Little Traveller. A fitted sheet is included. Only CAD$1 per day. Recommended for Little Travellers 6 months and up. ​Minimum 2-day rental on all items. During peak season (holidays, summer months) you may be subject to a minimum rental fee. The rental fees are per calculated calendar day not per 24-hour period.